Works have commenced on a distinct new drive-through at 100 Blackheath Road in south east London designed by The Harris Partnership. 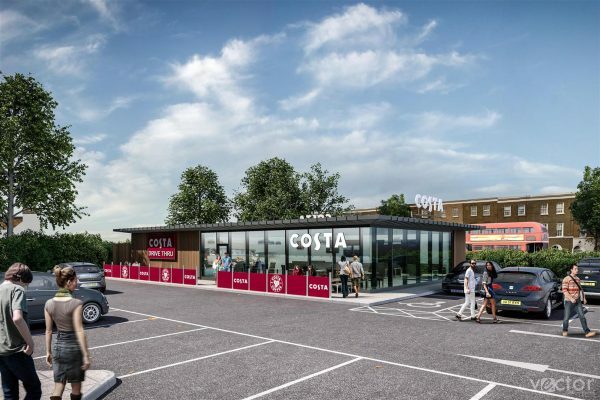 Managed by our London office, the 2,200 sq.ft pod unit, incorporates full height glazing to create a welcoming interior and allows for views out to the external seating area and retail units beyond on Blackheath Retail Park. The scheme employs high quality design and materials to ensure the overall appearance of the pod unit enhances the surrounding area. Due to the stand alone nature of the new building, the design has been developed with a modern aesthetic, but also borrows elements from the existing context in order to embed it into its surroundings. To create a soft, welcoming environment the use of contrasting treated timber fins are being used, offset against a sleek vertical standing seam cladding, extenuating the height through the articulation of the material palette. The new pod is restricted in height on Blackheath Retail Park to maximum of 3.25m, therefore careful articulation of the building form has been required which is targeted for completion by the end of 2018.